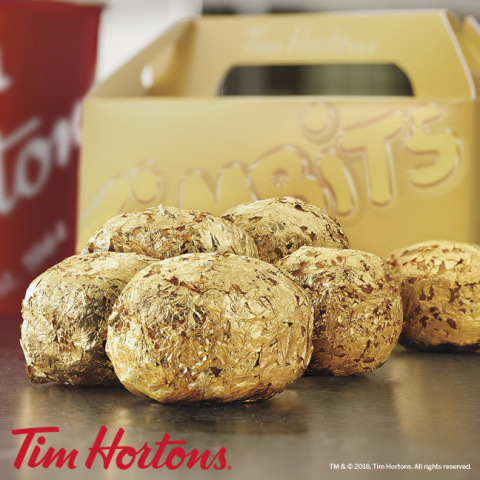 Strike Gold This National Donut Day at Tim Hortons® U.S.
NEW YORK--(BUSINESS WIRE)--National Donut Day just got a Timbit sweeter at Tim Hortons® with a golden opportunity. On June 1, Tim Hortons® U.S. Guests in select markets will have a chance to win free donuts for a year and strike 24k donut gold when they visit participating U.S. restaurants. Five specially selected restaurants across Buffalo, New York, Columbus, Ohio, and Detroit, Michigan will offer the 24k gold-covered Timbits®. The first in-restaurant Guest after 6am to ask for the “Gold Timbits®” at each one of these five locations on June 1 will win the prize of free donuts for a year. The 24k Gold Timbits® are honey-dipped Timbits® covered in edible 24k gold. No purchase is necessary to win. For full promotion rules go to www.timhortons.com/24kgoldtimbits.